This article is about the type of level found throughout the Mario franchise. For the Super Mario Maker sample level of the same name, see Castle (level). Castles are a common type of level in the Mario franchise. Usually found at the end of each world, they are usually where the Mario Bros. and their allies confront the world's boss before moving on to the next world. Besides housing the boss, castles also tend to be rather hazardous places, with lava being more frequently found in these places than in most other areas in the series. 1.1.7 New Super Mario Bros.
A Castle in Super Mario Bros. In Super Mario Bros., all castles are made of red bricks (except for the one in World 6-3, which is gray) and all have the same basic shape. The castles can be found at the end of each world, but can also be found at the start of most worlds, aside from World 1, the first level of the game, and World 5, which starts with a Fortress instead of a castle. Inside the first seven castles, the player will have to pass Fire Bars, Lava and other assorted dangers in a grey brick interior, leading up to an encounter with a fake Bowser; defeating the impostor will allow Mario or Luigi to free a mushroom retainer, who utters the infamous line "Thank you Mario! But our princess is in another castle!" It is only in World 8's castle that the Mario or Luigi actually confront the real Koopa King himself. Defeating him allows the heroic plumbers to finally rescue Princess Toadstool. Smaller castle-like fortresses also appear at the end of every level (except for the fourth level of each of world, where a normal castle appears) and the beginning of each water or underground level, where Mario emerges from and enters a Warp Pipe. Castles appear to be a fortress stacked upon a larger section. In Super Mario Bros. Deluxe, after completing a castle level, a cinematic is shown of Mario proceeding to jump repeatedly on a castle and causing it to collapse into rubble with a flag posted on top before moving on to the next world. As Super Mario Bros.: The Lost Levels is almost identical in gameplay and design as to Super Mario Bros. in terms of gameplay, castles play the exact same role in this game, and even look almost exactly the same as they did in their predecessor. However, Bowser can now be confronted in two of the game's castles rather than simply the last one. Castles are fairly sparse in Super Mario Bros. 2, with only one genuine castle making an appearance. This castle is located in the clouds, and is inhabited by the game's final boss, Wart, who had captured it from the King of Subcon. This castle is unique amongst most castles in the Mario series in that it looks more like a palace than a simple, lava-flooded citadel. Castles (called "Fortresses") in Super Mario Bros. 3 are found at the end of every world, but function completely differently than their predecessors do. Instead of housing the boss, each of the first seven castles will house one of the kings of the Mushroom World who had just been turned into an animal by one of the Koopalings. After speaking to the Toad accompanying the king, Mario/Luigi will board one of the Koopalings' Airships, where they will confront the Koopaling in battle. Defeating the Koopaling will cause Mario to fall into to the castle with the wand in hand, where he is greeted by the newly restored king and given a letter from Princess Peach. The last castle - Bowser's Castle - is a typical citadel-esque castle like the original Super Mario Bros., containing lava and a variety of traps. The level ends with a battle against Bowser, after which the Mario Bros. can rescue Princess Peach and finish the game. In addition to castles, a new level type called a Fortress appears which functions similarly to a castle: these fortresses always end in a battle against Boom Boom, who must be defeated in order to access some areas of each world. 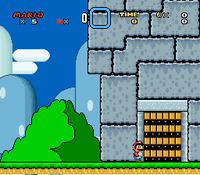 Mario preparing to enter a castle in Super Mario World. Like most of its predecessors, Super Mario World, castles will be found at the end of each world, where Mario will confront the world's boss - usually one of the Koopalings. Yoshi cannot enter castles, as shown in the cutscene at the beginning of each castle; this forces Mario or Luigi to head to the boss without him. The technical reason of why this happens is that Yoshi is not compatible with some enemies inside the Castles, notably Lava Bubbles. After Mario has defeated one of the Seven Koopalings, he will save a single Baby Yoshi and destroy the castle after exiting it. After the cutscene, Mario proceeds to the next world, giving the player a chance to save the game. The castles cannot normally be revisited in this game, only being replayable if the player holds both the and buttons at the same time while on the castle on the world map. 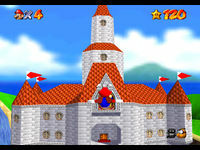 A view of Princess Peach's Castle from Super Mario 64. In Super Mario 64 and Super Mario 64 DS, the main hub world is Princess Peach's Castle. However, "castles" in the sense of the boss levels of the 2D Mario games do not appear in this game. After a long hiatus, Super Mario Bros.-esque Castles return in New Super Mario Bros. In this game, castles function similarly to how they had in prior 2D Mario games, being a dangerous, usually lava-flooded level that ends in a boss fight. A variety of boss enemies appear in these castles, from Petey Piranha to Bowser himself. The beginning of the game also features Peach's Castle, which is struck by lightning and ignited in the opening cutscene. While Mario is running off to investigate this mishap, Bowser Jr. appears and kidnaps Peach, forcing Mario to abandon the castle and give chase to the Koopa prince. The castle thereafter serves as part of the scenery of the first world. It can also be seen in 1-1. Castles in New Super Mario Bros. Wii work in a similar way to how they acted in the game's previous game. Mario and his allies traverse a dangerous, usually lava-filled area before having a rematch with one of the Koopalings; before the battle begins, Kamek appears and uses his magic to alter the battle in ways to make Mario's battle more difficult, such as increasing the size of Lemmy Koopa's ball or flooding Wendy O. Koopa's boss room. The final castle pits Mario and co. against Bowser, who is fought similarly to the original Super Mario Bros. Upon his defeat, Kamek appears again and uses his magic to turn Bowser giant, forcing the heroes to flee from the revived Koopa king for the rest of the stage. Castles also appear in Super Mario 3D Land. They once again serve as locations where bosses are fought, but unlike prior games are only found in four of the main eight worlds; one each in Worlds 1 and World 5, and two in World 8. The first two castles in the game are home to two fake Bowsers, while both in World 8 are Bowser's castles, and pit Mario against the Koopa King himself. In the Special Worlds, castles appear more prominently; however, they are almost always time trials, giving the player 30 seconds to complete. Dry Bowser resides inside the Special 1, Special 5, and Special 8 castles. Also unlike prior games, all the castles in this game have a giant Goal Pole at the end. Castles, along with Towers, return in New Super Mario Bros. 2, acting much like it did in the previous games. The Koopalings appear as the bosses only in the Castles, as the Towers are occupied by Reznor. A Hidden Block containing a Super Leaf can be found at the end of every castle before a Koopaling battle, with the exception of Lemmy Koopa's Castle, which has a Fire Flower in a Hidden Block at the end. Castles and Towers return yet again in New Super Mario Bros. U, acting much like it did in the previous New Super Mario Bros. titles. However, the path to the bosses are different. Mario and co. have to now shoot themselves out of a cannon to reach the airships the Koopalings reside in. Castles appear in Super Mario 3D World, similar to Super Mario 3D Land and the New Super Mario Bros. games. Only some bosses have castles before them, however - other bosses have either a different kind of stage before the boss fight, or have the whole stage dedicated to the boss fight. Once again, the Goal Pole can be found after defeating the boss, in contrast to most of the 2D Mario games. The seventh world of the game is also named "World Castle". Several of the racecourses in the Mario Kart series have had castles, either as part of the course or as part of the background. The most prominent castle in the sub-series is Bowser's Castle, as it appears as one of the courses in every game in the series. Peach's Castle has also had some appearances in the series. The Royal Raceway track of Mario Kart 64 features a castle that's outside can be fully explored. In Mario Kart: Super Circuit's Rainbow Road, the castle can be spotted on top of Bowser's Castle, like in Paper Mario, in the background. In Mario Kart: Double Dash! !, it appears on Mario Circuit and vaguely on Mushroom Bridge, but also as part of the track's background. The back of Peach's Castle is featured in Mario Kart DS, on the Peach Gardens course. In Mario Kart Wii, the castle once again appears in the background of Mario Circuit. Mario Kart 7 also features Peach's Castle (once again on Mario Circuit), although this time it is a part of the track and the player is able to drive up a windy path inside of the castle. Mario Kart 8 features Peach's Castle in the courses Mario Circuit and N64 Royal Raceway. Yoshi outside a castle in Super Mario World 2: Yoshi's Island. Like in most other games, the castles in this game are found at the end of the World the Player is in. However, the creature found at the end usually does not intend to harm Baby Mario and Yoshi, until Kamek comes, and transforms it into a huge boss for the Player to fight, trying to slow down or even stop Yoshi from reaching Baby Bowser's Castle. Once the player gets to Baby Bowser's castle, even though it is guarded by Kamek, the player does not get to fight Kamek; instead, the player will fight Baby Bowser, powered up with Kamek's magic. 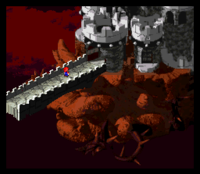 The entrance of Bowser's Castle from Super Mario RPG: The Legend of the Seven Stars before being destroyed by Exor. In Super Mario RPG: The Legend of the Seven Stars, near the beginning of the game, Mario will go to Bowser's Keep to rescue Princess Peach from Bowser. Also, castle-like areas appear in some places. In Paper Mario, the Koopa Bros. Fortress and Bowser's Castle appear in the game. Hooktail Castle, the castle that appears in Paper Mario: The Thousand-Year Door. In Paper Mario: The Thousand-Year Door, Hooktail Castle appeared in the first chapter of the game. Bowser's Castle also appears, but only serves as an interlude. The Thousand-Year Door's interior can also be considered a castle-themed location, since castle enemies such as Dry Bones appear. Super Paper Mario includes Fort Francis and Castle Bleck. Bowser's Castle again appears only in the prologue cutscene. In Paper Mario: Sticker Star, Goomba Fortress and Bowser's Sky Castle appear. In Paper Mario: Color Splash, Bowser's Castle is known as Black Bowser's Castle, due to Bowser being possessed. The Bowser fight in Super Mario Bros. The first Bowser fight in New Super Mario Bros. The Mummipokey fight in New Super Mario Bros. The Cheepskipper fight in New Super Mario Bros. The Mega Goomba fight in New Super Mario Bros. The Monty Tank fight in New Super Mario Bros. The Lakithunder fight in New Super Mario Bros. The Dry Bowser fight in New Super Mario Bros. The final Bowser fight in New Super Mario Bros. In the 2010 version of Nintendo Monopoly, there is a Brick Block card that rewards the player with $100 for inheriting a castle. Every castle in the New Super Mario Bros. series has a Hidden Block next to the boss door, containing a power-up. In the Pikmin Adventure attraction of Nintendo Land, stage 14 "Out of the Darkness" features a structure at the start that resembles the Castles in Super Mario Bros. In Super Mario Galaxy 2, the Bowser levels at the end of Worlds 2 and 4 are represented in the map as Castles. In the castle theme of Super Mario Maker, if the bridge is taken down, all enemies on screen will fall into the lava (even if they are not placed on the bridge). ↑ Super Mario Bros. 3 English instruction booklet, page 25. ↑ Super Mario Bros. 3 Japanese instruction booklet, page 24. This page was last edited on April 4, 2019, at 19:38.